• Using a heavy duty waterproof electric cord design to resist oil, grease and moisture while providing abrasion resistance. 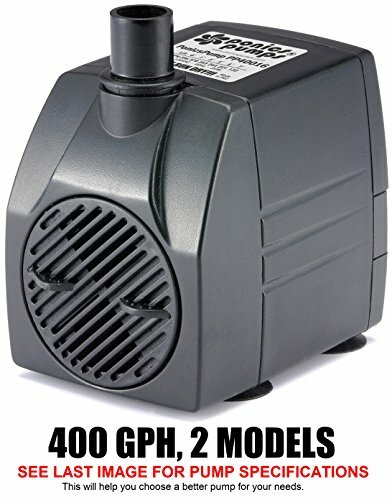 NEED HELP IN CHOOSING A PUMP? Please see our guides and specifications in the photo section above. NEED HELP IN CLEANING YOUR PUMP? Please see our disassembly / re-assembly guide in the photo section above. SAFETY WARNING: USE ON GFCI CIRCUIT! To protect against dangerous electrical shock, always use any submersible pump on an electrical circuit that has Ground Fault Circuit Interrupter (GFCI) at either the plug or the breaker. One year limited warranty only when product is purchased from FasterHarvest®. COMPLETE SELECTION: We have 8 sizes & 19 models. This model has an attached high quality 16 foot waterproof cord. A similar model with a 6 foot cord is available. Comes with adjustable input flow-rate screen and 3 outlet adapters for 1/2", 5/8" and 3/4" inside diameter tubing. If you have any questions about this product by PonicsPumps, contact us by completing and submitting the form below. If you are looking for a specif part number, please include it with your message.